It’s a short but sweet reminiscence this week, prompted by the chance sighting of our only flying Vulcan G-VLCN (military identifier XH558) as it headed for the Weston Air Festival on a recent Sunday afternoon. Seeing G-VLCN (I thought our personal number plate was a good one!) flying over was a wonderful experience. I only just caught her, saw her heading south from a bedroom window, rushed to grab the camera and snatched a shot at full zoom just as the V bomber was about to disappear over our neighbour’s roof. 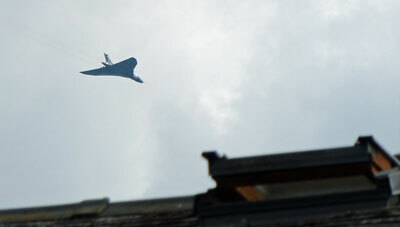 Avro Vulcan XH558 about to fly into my neighbour’s open Velux window! Why the emotion? 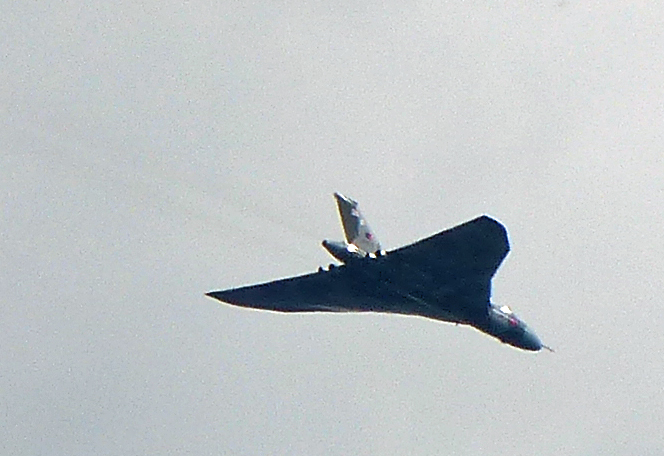 Well, the last time I saw a Vulcan flying for real was back in the early 1960s when we lived in Bristol. I must have been about five then, when Vulcans – at that time part of our main nuclear deterrent – flew over regularly. Seeing G-VLCN The Spirit of Great Britain again reminded me how far I’ve come in 50 years. Back then I drew and wrote little stories, made aircraft and hangers out of plasticine. Now, as well as doing all those things (!) the writing’s taken on a whole different meaning. It’s been a fascinating journey from a Bristol childhood to working as a freelance copywriter just up the road in Cheltenham. I think back over growing up in Bristol, then in Northern Ireland through The Troubles. Then uni at Cambridge (and pistol shooting under the wing of a retired Concorde at Duxford) followed by years in technical selling, marketing, business development, technical writing,, copywriting and PR across southern England. I developed a passion for Switzerland and British Columbia, got married, got divorced, married again, wrote a novel with an aviation theme and settled under the Cotswold escarpment with the two loves of my life – my wife and my words. It took nearly 50 years from sitting in that garden looking up at the Vulcans, but I finally got back to where I’m meant to be – a passionate creative who loves using paper and pencil (or a word-processor now) and has been known to do aviation and defence-related copywriting. Over the years, my interest in aviation sustained, probably helped me get into an aviation tech pubs firm where I worked for Airbus (including doing my bit on the A-380 Tooling & Equipment Manual) and Rolls-Royce (manufacturer of the Vulcan’s Olympus engines) and worked alongside people who maintained and flew Vulcans in those halcyon 1960s days… including one who carried the Magna Carta to the USA aboard a Vulcan. Looking at the Wikipedia page for G-VLCN/XH558, I see that the aircraft first flew on 25 May 1960, which makes me a few months older than her! We’re both going strong after all those years: me with my marketing, website, brochure, technical and case study copywriting; the Vulcan as the only surviving flying example of a bygone age when Britain’s airborne nuclear deterrent really was something to be respected and admired. That particular branch of the RAF may have gone, to be replaced by a handful of sinister, prowling missile submarines. But the Vulcan continues to rouse the passions of virtually everyone who sees (or hears) her. This entry was posted in Copywriting Resources, Uncategorized and tagged a-380, a380, airbus, aviation and defence copywriting, avro vulcan, cheltenham copywriter, copywriters gloucestershire, copywriting, magna carta, pr writing, Rolls-Royce, technical writing, tooling and equipment manual, v bomber, vulcan on July 1, 2014 by alwrites.